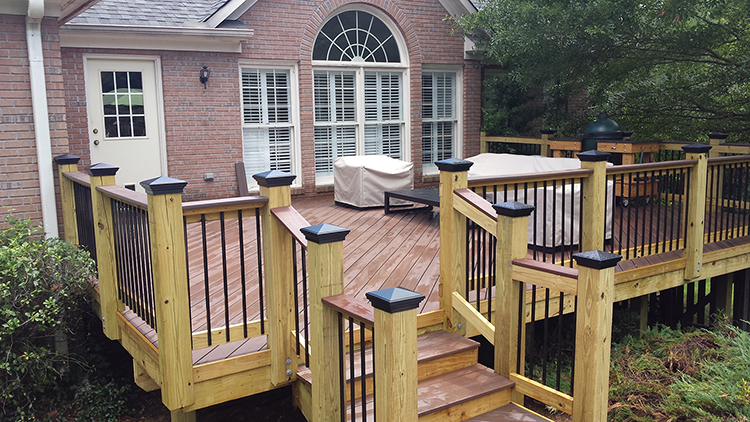 When we first met with these Macon GA homeowners, they knew they wanted a new deck to overlook their pool. They wanted a great space to fit a table and chairs as well as their Big Green Egg smoker. Looking with some foresight, they also knew they wanted to add to their current sunroom at some point in the future. They had a current deck but wanted to make sure this deck’s foundation could accommodate a roof in the future. In order to achieve that objective, we demolished the existing deck and built the substructure of the new deck to accommodate the additional weight of a roof for the future. Appreciating the importance of doing it right the first time, they were careful to evaluate their future growth plans and to share those plans with us. It is not all too uncommon for homeowners to know they want a porch in the future but also know it’s not in the current budget. Indeed the foundation is a bit different for a deck than it is for a roofed structure. It’s not much more expensive to build extra reinforcement into a deck substructure allowing yourself full flexibility for the future. They had originally envisioned a bay-shaped deck but decided a more traditional rectangular shape but also a larger size. Also in their original visions of their deck, they considered traditionally sized railing posts. Upon further consideration, they decided to go with a larger and bolder sized deck post with an elegant and attractive cap on each. 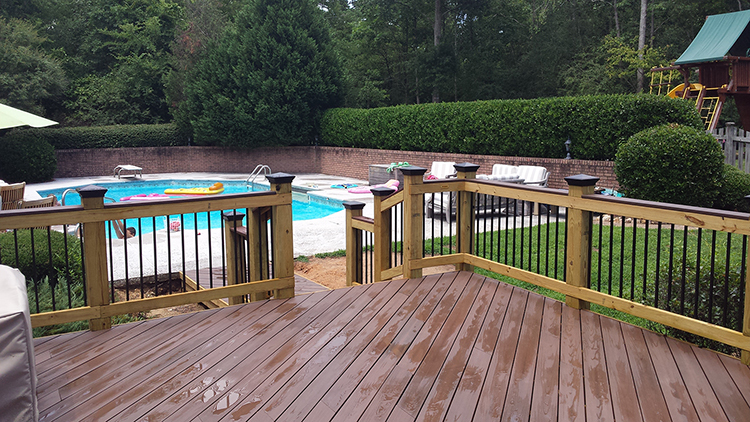 The deck posts and complimented by black metal pickets to match the rail caps. Applying the same additional options considerations, they also decided to upgrade to composite decking. This Fiberon ProTect composite decking is low-maintenance and will alleviate all annual maintenance. 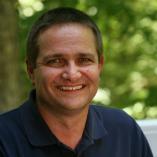 They will never need to think about staining, scraping, sealing, fading or the other maladies that befall genuine wood. The decking is in an attractive warm chestnut color. The final very important consideration for this pool deck was the foot traffic from the deck to the pool. They knew they didn’t want to hose down their deck when feet wet from pool water turned into muddy footprints on the deck. Similarly, they didn’t want muddy feet entering the pool. 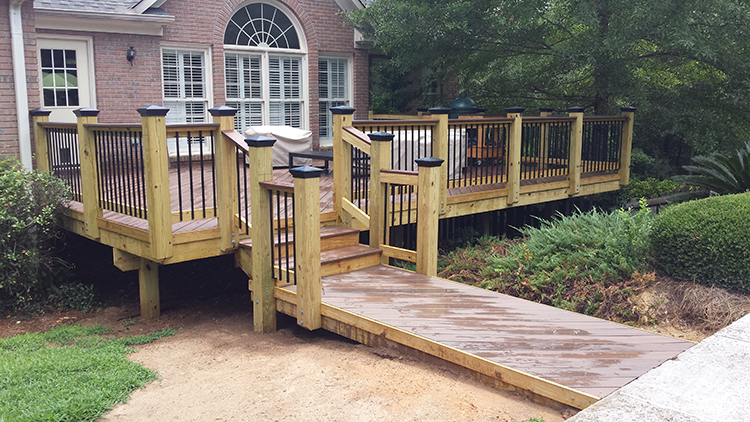 The decided on a very clever footbridge finished with the same Fiberon composite decking to match the deck. Even though the feet leading from the pool to the home will be wet, they will not need to worry about warping nor will they need to worry about splinters. Even though building a new deck or outdoor living space is exciting with thoughts of what your space will be like that season, it’s also very important to think about how you may want your space to evolve over the years. You also don’t want to look back and wish you had chosen a slightly more pricey material option that would require far less maintenance over the years. Talk to your builder about your current needs as well as your future desires for the space. Let them know how you plan to use the space, how often and with how many people. Good builders are happy to share what they’ve learned after building hundreds of spaces for other local homeowners.